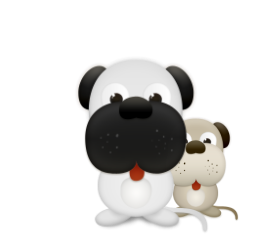 News, Dog rescue and re homing in Sussex, Surrey, Cambridgshire, Bedfordshire, Huntingdonshire - www.desperategreekiesdogrescue.com, Dog rescue. Please help by making a small donation towards this very important program. Every pound really makes a difference Thank you for your kind support. Maybe you could save and print the following and display somewhere or hand a copy to friends to help raise funds and awareness. After spending all our own money helping in Greece we decided to start Desperate Greekies to raise funds and awareness to help us continue. Over the years on our countless trips we have taken many van loads full of useful items, medicines, vaccines, flea/worm treatments and food to the shelter. We have bodged, repaired and replaced kennels, fences, gates, pens, roofs, concreted many stoney, stinky, dangerous and muddy pen floors, but the shelter is still a harsh, dismal place to live. It is heartbreaking to see these wonderful animals endure their miserable life. We have taken countless dogs and cats to the vets for treatment from wounds to surgeries. Walked, cuddled, given haircuts, cut hundreds of nails, some growing in the dog's pads and spent time with the animals whilst staying at the shelter, anything just to try to make things a bit safer or more tolerable for them. The animals get almost no attention and never leave their pens or chains, not even for a walk. Desperate Greekies are the only regular daily food source for the 180 dogs, 40 bags of food are used every week, and this is only just enough for very basic rations. The food costs 14.50 euros per 20kg bag, that's around £10.60p. We really need help to supply the funds for this food, we are struggling and are concerned we won't be able to continue with this massive task without more assistance. We made feeding and sterilising our priorities after witnessing many distressing scenes, dogs having to eat mostly stale and mouldy bread or dangerous chicken bones and rice boiled until it resembled glue. The cats ate bones and rice too! 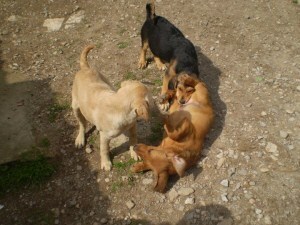 Dogs mating, pregnant dogs, puppies being born in filthy pens already occupied by many dogs. The mothers so distressed trying to defend the puppies who often died or were killed by others, if the puppies survived they joined the awful daily misery. All dogs are currently sterilised at the shelter. Around 80 cats, every female cat pregnant or trying to nurse kittens, cat flu, respiratory diseases, sick and dying kittens all around, puppies left to wander, innocently playing with kittens, unknowingly very often fatally injuring their tiny bodies. Occasionally we have been given a donation for sterilising and get very excited about this, we put the money to work immediately. Since we have been involved in Halkida over 3,000 shelter and stray animals have been sterilised at our request either by our fantastic Romanian vets accompanying us on visits or by two local vet clinics that kindly give a reduced rate. Thousands of babies never born to suffer. Hundreds of dogs have been brought to a new life by DG, our wonderful Juliet helping us find many lovely homes. If you could help us make a difference by making a donation or set up a monthly direct debit to be used for the critical food situation or to help neuter a dog or cat. No gift is too small. Thank you for reading. Our search for funds for the next neutering campaign is constant. These babies all look so sweet don't they? The reality for them is a barren concrete pen that they will never leave, minimum of food, no treats, no loving owner, no home comforts, no walks, games or toys just boredom, hardship, loneliness, and misery for the whole of their lives. They really would have been better off never being born, neutering is the answer, please help stop more babies born to this and worse. 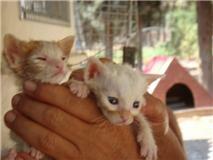 On a trip to Greece our Desperate Greekies founder came across a litter of kittens. This is just one of many heartbreaking stories. When I arrived the kittens in the above pictures were by the road. Their mother had been killed. They were so tiny, so hungry, crying for there dead mum, I nursed them every 2 hours with a bottle for the 8 days I was there, I had to not only get them to eat, but wash them and try to get them to toilet as mum would have done. My warm damp sponge wasn't a patch on their mums tongue, it was a real struggle for them. On the 7th day the smallest kitten died, as I buried its tiny body that weighed no more than a sparrow, I thought to myself.. no more struggling and suffering now for you little one. When I left the other two kittens, especially the tabby were doing very well. 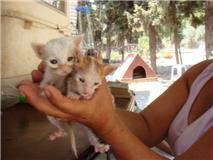 The lady who cares for the animals virtually single handedly added the kittens to her workload. The neutering program is coming closer.. 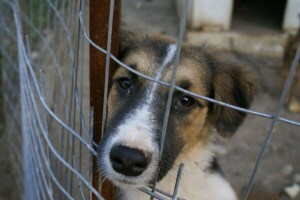 The more animals that are neutered the less of these pitiful sights will be seen. It was 40 degrees the latter part of the days I was in Greece, this is a harsh place for neglected strays where the only food & water available is what they can scavenge. 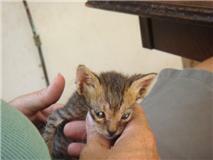 There is no let up from the sun, the very young, orphaned, old and sick animals dehydrate very quickly. Please help us make a difference.